The Acting Chairman of Independent Corrupt Practices and Other Related Offences Commission, Dr. Musa Usman Abubakar has affirmed that the Commission was making considerable progress in galvanizing Nigerians to tackle the menace of corruption. Dr. Abubakar who was represented by Mr. Larry Abuo of ICPC’s Corruption Monitoring and Evaluation Department, was speaking at a sensitization programme for staff of Kwali Area Council organized by the Anti Corruption and Transparency Unit (ACTU) of the council in Kwali recently. He said ICPC had done a great job of mobilizing the populace and liaising with institutions to give vigour to the fight against corruption which were necessary requirements for success to be achieved, noting that the Commission had fashioned out the NAVC, Students Anti-corruption Vanguard, NYSC/CDS groups and other initiatives as “something for mobilizing every segment of society”. He cited ACTU as one of the potent tools employed for this success, describing it is an extension of ICPC that has sensitization of MDA staff against the various manifestations of corruption as one of its duties. 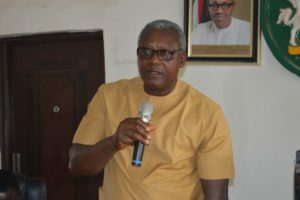 The ICPC Acting Chairman, therefore, urged the council staff to imbibe lessons from the sensitization programme to ensure that they became better workers. In his own remarks, the Council Chairman, Hon. Joseph Shazin, said that fighting corruption was ‘the top priority of the present administration as such the council will do everything possible to eradicate the monster’. Hon. Shazin advised the ACTU members to regularly organize training in order to equip the staff of the Area Council for better performance, while assuring the ACTU of his support. Papers presented by resource persons from ICPC covered areas such as Best Practices, Professional Ethics and Code of Conduct for organisations as well as Public Education and Advocacy against corruption.